1. Remove this listing from my Google Places account. 2. Remove this listing from Google Maps. 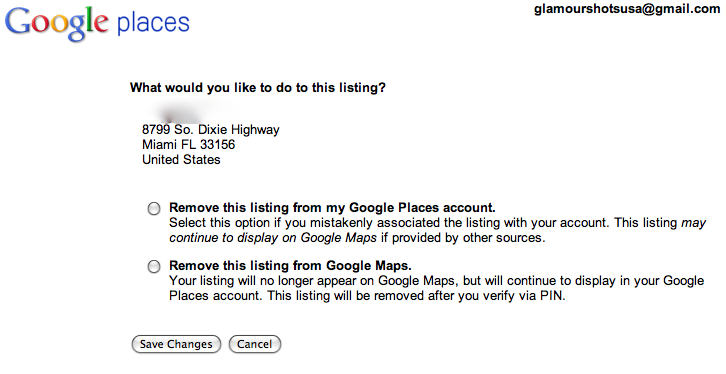 Your listing will no longer appear on Google Maps, but will continue to display in your Google Places account. This listing will be removed after you verify via PIN. Based on these two options, it doesn’t look like removing a Google Maps listing will in turn get it removed from Google Places unless verified by the appropriate business representative via PIN. Or is the second option telling Google Places listings they can get their Google Maps listing removed but not their Google Places listing? Couldn’t the instructions for removing a Google Places listing use some additional clarification or is it just a misunderstanding on my part? This entry was posted on February 22, 2011 at 6:38 pm and is filed under Deleting A Google Places Listing. You can follow any responses to this entry through the RSS 2.0 feed. You can leave a response, or trackback from your own site.